sesame seeds (til) recipes collection. Indian sesame seeds recipes. Sesame seeds are tiny, oval shaped seeds that are a little nutty in taste and give a slight crunch when you eat them. They are available in different colors – white, black or even yellow – even though the taste difference is negligible. Sesame seeds can be had roasted, added raw to recipes or turned into a paste. They are used in Asian cuisines along with Indian and Middle Eastern. They never over power the food they are added to, they just provide a subtle nutty taste. Sesame are also known as Til in India. They are used in a variety of Indian recipes ranging from sweets to savories. The first thing that comes to my mind when I think of til is Chikki. Til Chikki is a sweet that is mostly made during Makar Sankranti, where sesame seeds are mixed with melted jaggery to form sheets, that are cut and eaten once hardened. In the same way you can make Til Ladu, an old but gold recipe. In India, sesame seeds are used as a garnish, as a topping or even in gravies of different subzis. Black Sesame seeds are put over naan, like the Whole Wheat Coriander and Sesame Seeds Naan, to give their nutty flavor, roasted and grinded into pastes with other whole spices to form the base gravy of Hyderabadi subzis like Mirch ka Salan and Baghara Baingan and added to doughs to make delicious khakhras. Sesame seeds make a great addition to different types of snacks. Due to its versatility, it can be added at any stage whether beginning or the end. A tadka of sesame seeds and curry leaves is poured over the Gujarati classic, Khandvi, along with coconut and coriander while a similar tempering is also poured over the ever tasty Khaman Dhokla. The seeds are can also be directly added to the batter of Mixed Dal Handvo, or be tossed along with stead Doodhi Muthias to coat them well. Roasted Sesame Seeds are super flavorful and full of nutty goodness which makes them an excellent garnish for a lot of dishes. From Chatpata aloo, which has potatoes tossed in a bunch of different spices to Crackling Spinach, which is just simple fried spinach with oil, both use roasted sesame seeds as a garnish. Tahini, is a middle eastern a roasted sesame seed dip which is served as a side dish with chips as a dip or used as an ingredient to make other dips like hummus and Baba Ganoush. White sesame seeds are also widely used to decorate artisanal breads and is seen used on burger buns and bagels. Sesame seeds are sprinkled over certain foods in a variety of Asian recipes like Sushi in Japanese or the Chinese Stir Fried French Beans and Garlic. Its unique taste is an extraordinary addition to a Mongolian Stir Fry of colorful vegetables or to a dipping sauce for Vegetable Dumplings. If you want to know more about the Uses of Sesame Seeds, then you can check out our article on that. 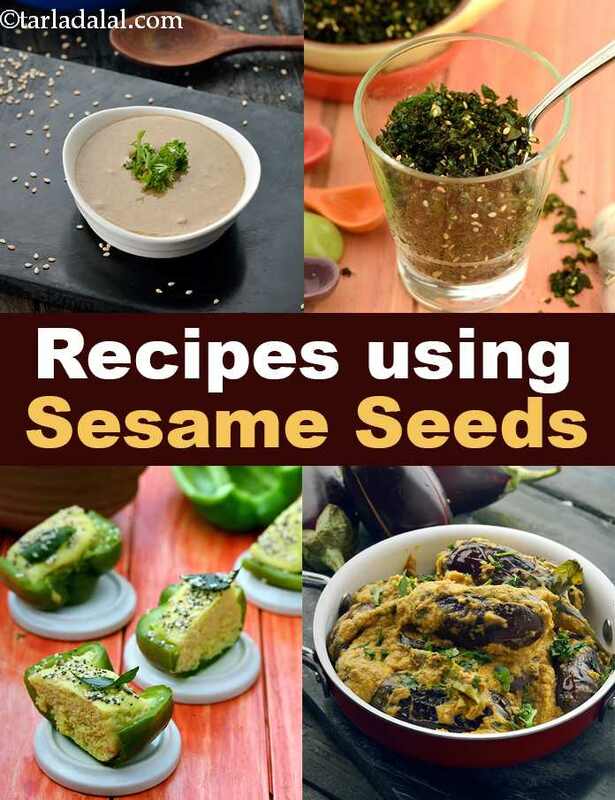 Hope you like this collection of Recipes using Sesame seeds. Scroll down below for more.